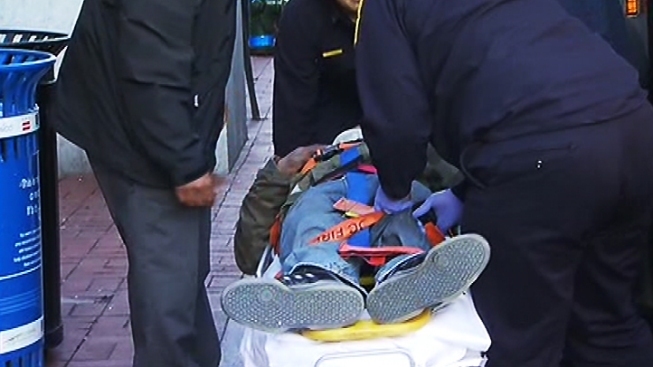 Pedestrian Struck by Metrobus in Downtown D.C.
D.C. police say they will cite a pedestrian who was hit by a Metrobus downtown shortly before 8 a.m. Thursday. It happened in the 700 block of H Street NW. Witnesses told News4's Tony Tull that the victim was not in the crosswalk when struck. They said he ran partway across the street but hesitated, which was when he was struck by the right front of an X2 bus. The impact smashed the bus' windshield. After the crash, the victim was conscious and breathing, but unable to move. Other pedestrians came to his aid until D.C. Fire and EMS arrived at the scene. The victim was transported to Howard University Hospital with non-life-threatening injuries. Metro officials said the man had already dodged one car right before running into the bus.